Reminds me of the Raphael figure from back in the day. Too bad I lost the darn bubble helmet. -->> ..yeh safe guess it may have been Playmates design , the " L " and the initials were associated with the original Toys, Toon and TMNT A comics. But the computer does most of the thinking for you there :). 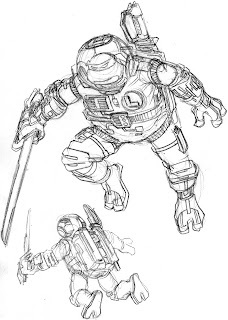 We have all the paladium TMNT books and this does look a little like the cover of the space one. -->> True, but the guys didn't have the initials on their suits on the game book. Good blog, thank you! I really love it. amazing!